I am working extensively with Visual Studio 2013, Office 365 and Windows Azure, researching cloud development on Microsoft’s platform. It is in general a reasonable experience, but the way Microsoft manages its cloud accounts is a constant annoyance and sometimes a source of bugs. The problem is that you cannot manage with just one Microsoft cloud account. I have an MSDN subscription which is a Microsoft account, and an Office 365 subscription for which I log in with an Organizational account, for example. Microsoft accounts are for accounts with Microsoft itself, while Organizational accounts are controlled by my business. The distinction makes some sense, but Internet Explorer does not cope all that well when you are using both, which for development seems unavoidable. 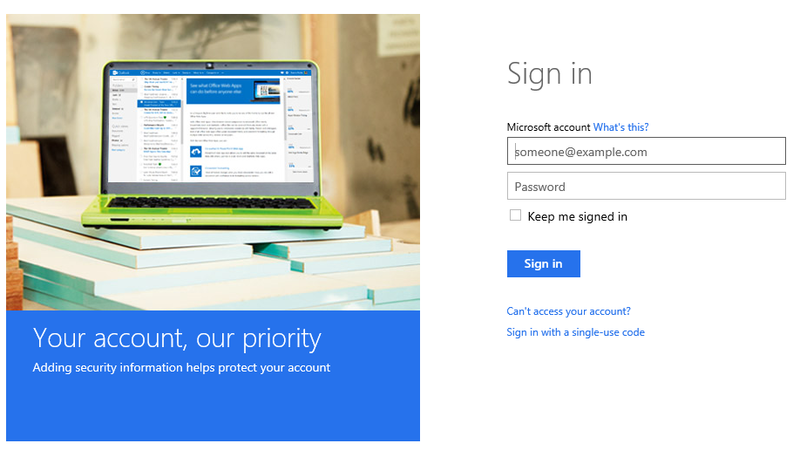 This is for a Microsoft account, which will not work with Office 365. If I now present Organizational account credentials, it says the account is not recognized. 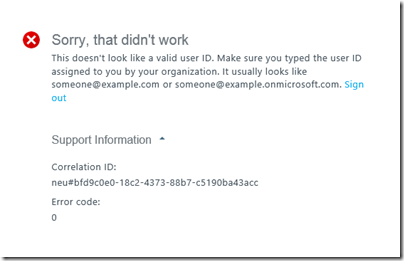 If I present valid Microsoft account credentials, I get an error. “Sorry, that didn’t work”. Agreed – but if I now click Sign out, I bounce back to the very same screen. In other words, I cannot sign out. I have also seen the scenario where you cannot sign out of Office 365. You choose Sign out, Internet Explorer thinks for a moment, then logs you back in automatically. 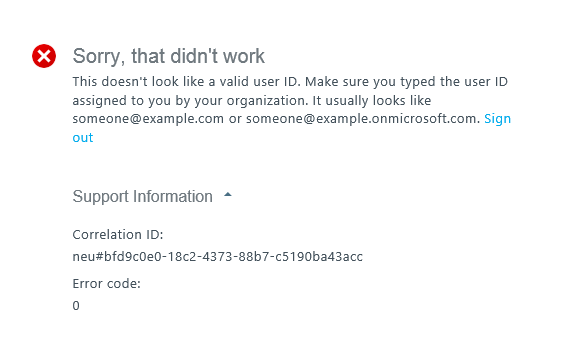 This may be a consequence of checking the mysterious “Keep me signed in” option when logging into Office 365. This should only keep you signed in until you specifically log out, but it can fail in both directions, asking you to sign in again later, or failing to sign you out. “Keep me signed in” is actually required for some features to work properly, such as Open in Explorer (or WebDav) in SharePoint online. The inability to sign out is a security issue, since you may need to leave your machine, think you have signed out, and find someone else can access your account; though I suppose you can lock your Windows account to overcome this. It can also be a practical problem. As a developer, you might want to log in with an Office 365 administrator account to configure a new app, and then with a non-administrator account to test. You need to be able to switch accounts for this purpose. It might be better to use a virtual machine for one of the two accounts. I am not sure what the fix is, though it usually starts working again eventually. As ever, rebooting Windows may well help. Microsoft has a problems when signing out article which hints at some of these problems; it suggests that you to a couple of special logout urls to log out from an organizational account and logout from a Microsoft account but this does not always work. It also suggests clearing all cookies, which is a nuisance because then have to log back in to all your internet accounts, but even this can fail in my experience. Using another browser is a partial workaround. I do not know if you can get this problem in other browsers. Visual Studio can also get confused. Imagine you are developing an Office 365 application hosted on Azure. You might have a Microsoft account for Azure along with the Organizational account for Office 365. You proceed through a publish wizard which needs both sets of credentials, and you are likely to get an error in my experience. I have found that I can partition at most 2 identities using IEs InPrivate browsing – this seems to isolate InPrivate cookies from normal IE mode cookies. However, separate instances of InPrivate tabs share cookies unfortunately.